A novel, which brings together serf and master, Cossack and tsar, priest and Jew in a family saga which unrolls through centuries of history to reveal the mysterious land...Russia. In this vast and gorgeous tapestry of a novel, serf and master, Cossack and tsar, priest and Jew are brought together in a family saga which unrolls through centuries of history to reveal that most impenetrable and mysterious of lands...Russia. 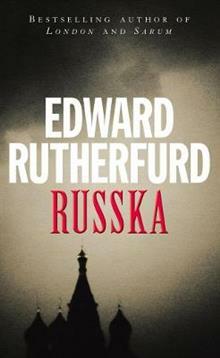 Through the life of a little town east of Moscow in the Russian heartland, Edward Rutherfurd creates a sweeping family saga from the baffling contradictions of Russia's culture and her people - bleak yet exotic, brutal but romantic, land of ritual yet riddled with superstitious fears. From Russia's dawn and the cruel Tartar invasions to Ivan the Terrible and the wild Cossacks, from Peter, Catherine and the days of 'War and Peace' to the drama of the Revolution and the extraordinary events of today - here is Russia's story in a spellbinding novel...history recreated with breathtaking detail and passion.